As part of its plan to enter the smartphone market, Google acquired a relatively small company named Android Inc. during the summer of 2005. About three years later, the first commercially available Android-powered smartphone went on sale. A bona fide hit, the HTC Dream was an important piece to a massive puzzle that would have a major impact on the software industry as a whole. Although it’s widely recognized as a mobile operating system, Android is used across a variety of different hardware platforms, including smartwatches, desktops, notebooks, smart TVs and game consoles. With such a robust wheelhouse, Google’s thriving OS has racked up a lot of accomplishments in a very short time. Google recently announced that Android 6.0 will officially be named Marshmallow and as a bit of a high-five to the search giant and its newly flavored operating system, we’ve compiled a list of Android factoids and milestones that you may not know about. 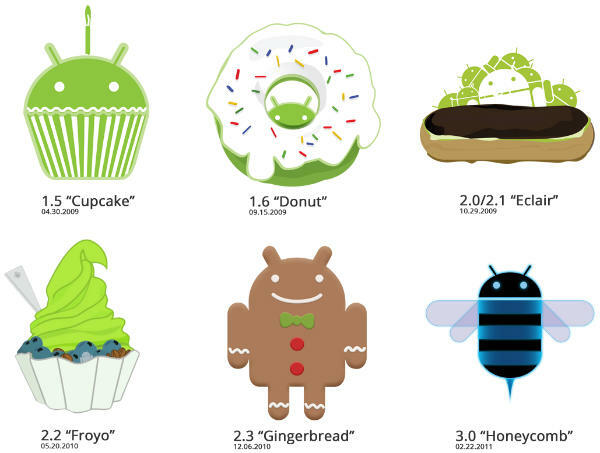 The very first public release of Android was version 1.5 Cupcake. After its success, Google went on to continue naming its mobile operating system after dessert treats. However, during the platform’s early development days, pre-commercial software versions carried internal robot-themed codenames like “Astro Boy,” “Bender,” and even “R2-D2.” After Android’s first public release in 2008, Google decided to retain its dessert-themed branding scheme, and has since named its software sweet foods in alphabetical order. In addition to commercial releases, an early software update for Android carried a snack inspired moniker. Initially released as software update for the HTC Dream, a patch internally referred to as “Petit Four” was named after a small French dessert. In early 2011, Google launched Android 3.0 Honeycomb. Designed specifically for tablets, this large screen-focused operating system’s inaugural device was the Motorola Xoom. Unfortunately, Honeycomb received mostly negative reviews from critics and users. Google quickly replaced its ill-received software with Android 4.0 Ice Cream Sandwich. Instead of working on another tablet-centric operating system, the company elected to add large display support to all Android releases going forward. Ever gone for a night out on the town and notice that a lot of people are using Android devices? Don’t worry, it’s not just your favorite pub or eatery being flooded by smartphones and tablets running Mountain View’s flexible software. Just shy of two years ago, newly crowned Google CEO Sundar Pichai announced that there have been over 1 billion Android activations. To help put this figure in perspective, it’s estimated that the world’s current population is around 7.3 billion people. Google’s Android Market went live back in 2008, just a few months after Apple’s App Store. But despite launching in such close proximity, the search company’s digital storefront just recently overtook its main competitor. Rebranded in 2012 as Google Play, Android’s software depot now offers around 1.5 million applications. If you’re looking to add some new icons to your device’s homescreen, here are a few of our favorites. The HTC Dream is known for its sliding AZERTY keyboard and 3.2-inch touchscreen, but the device’s ancestors offered something very different. Pictured above is a shot of the HTC EXCA 300 aka the “Sooner.” This “Android reference device” appeared to draw inspiration from earlier BlackBerry and Palm OS handsets. Equipped with an OMAP 850 processor and a whopping 64MB of RAM, this unreleased gadget helped pave the way for some of the Android smartphones that people enjoy today. Who designed the Android logo and what is its name? Just like its software, the Android platform’s mascot is also open source. This is why we’ve seen it dressed up and restyled so many times over without any type of real backlash from Google. The company’s little green robot was designed with a unisex-like tin can shaped body that takes cues from the male and female icons found hanging outside of restroom doors. It was created to be simple and easily recognized. But who designed it? Android has been available to consumers for almost seven years and boy has it accomplished a lot in such a short period. The platform currently has the largest number of global smartphone shipments and it’s making tech affordable in emerging markets. What started out as an operating system for smartphones has stretched to multiple platforms and doesn’t appear to be slowing down. Did this selection of statistics test your Android IQ or do you have a few tidbits that you’d like to share? Be sure to share your favorite Android factoids in the comments below.